What was the worst most over hyped knife you ever bought? Discussion in 'General Knife Discussion' started by Joshua1973, Sep 11, 2018. Share your thoughts on the worst over hyped knife you ever bought in your childhood or even recent. I will share 2. First one being the survivor knife on tv in the early 1980's. This thing came with a horrible sheath and was touted as 420 bonded molecular steel and upon seeing it thrown I had to have it. So in 82 or 83 I ordered this knife for $10 bucks plus shipping. Back in this day we did not have 2 day shipping or anything close to it. Try 8 to 10 weeks. I finally got my knife and went out in the yard to use it and I chucked it in a tree and the handle snapped clean off and broke in half in 2 places. The tip was bent 90 degrees to the right side, and the threaded steel that connected the knife to the handle was snapped off and lost in the grass to never be recovered. My second experience was recent with the Cold Steel Royal kukri. Blade was way off balance for a decent Kukri style machete. But that damn polypropylene handle sucked period. I tried it on brush and I felt a shock in my hand that felt very painful. Tried gloves, No help. Nasty hand shock. I gave it away a few days ago. Hand shock was so bad my hand hurt for a week afterwards. I never felt as horrible jolt to my hand as polypropylene puts out when hitting a few small branches or hardwood. afishhunter, Sharperthansticks and Humb baby like this. HTM knives as a company in general. Seems like there was huge hype around them and they blew it by releasing nearly every knife defective. bud1911, bflying, Charlie Mike and 3 others like this. Theres a reason why. They blew their chance. Came out right at the peak of the ti framelock craze with the DDR Gunhammer. Everyone was talking about them. Charlie Mike and Joshua1973 like this. Boy they did blow it if every knife came defective. That is pretty bad. What was the main defect? Lock issue? Blade play? Lionsteel Kur Metamorphosis, AKA the flipper that does not flip no matter how hard you try, is prone to open itself in your pocket, has to be carried in a belt pouch but that got handles neatly change color. I keep it as a reminder of not being caught by marketing again. But this is a damn terrible piece of a knife. 2016 Blade Show Knife of the year, piece of junk of the decade to me. VernonRemington, Gafishing, 4mer_FMF and 1 other person like this. Wow. That is pretty bad it won't flip open but will open in your pocket with no effort. With traditionals, you get all sorts of praise for the Case peanut. But if you get one, you won't believe it's a usable knife. In time it grows (shrinks) on you. You either decide it's all the knife you'll ever need, or it'll make a good emergency birthday gift to someone. NewWaveGuy, Gravy, Stelth and 6 others like this. This will come as a huge shock. However this is what came to mind. Blade would not hold a sharpish edge for more than a day at work. Handle shape just weird like a hunk of plywood with a blade stuck on it. Blade shape / point of the blade poor at slitting packages cleanly enough to reseal them for retail work. I'll take a Para 2 over a Manix any day of the week. And the thing people did not like about it I actually had no problem with. Some felt it was just too wide when closed from spine of blade to back spacer area of handle. It did middle finger flick nice though. Durham68, seabil, bflying and 1 other person like this. Microtech DE Executive Scarab. Bought it back when I was young and had disposable income and wanted it for the novelty factor. Was not worth the money. It's not a bad knife, but was SO not a good use of the money I spent on it. Could have bought multiple knives for the price that would have gotten a lot more use. It's still really cool and all, but every time I look at it the Maine spendthrift in me cries a single tear. My second experience was recent with the Cold Steel Royal kukri. 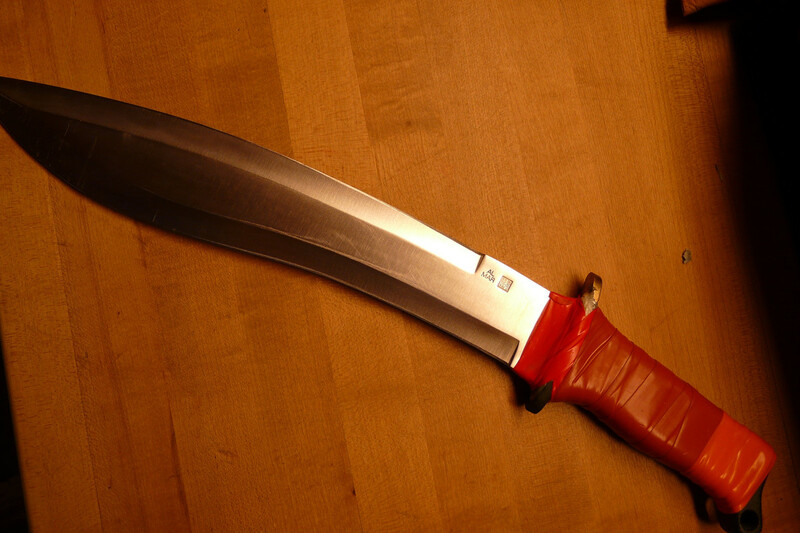 Blade was way off balance for a decent Kukri style machete. But that damn polypropylene handle sucked period. I tried it on brush and I felt a shock in my hand that felt very painful. Tried gloves, No help. Nasty hand shock. I gave it away a few days ago. Hand shock was so bad my hand hurt for a week afterwards. I never felt as horrible jolt to my hand as polypropylene puts out when hitting a few small branches or hardwood. I actually like that one quite a bit more than their other kukri models. Polypropylene doesn't transmit any more shock to the hand than wood (less, even) and it sound like you were landing your blows forward of the sweet spot. It's actually a PVC hard rubber handle on those, though, if I'm remembering right. It's not polypropylene, at the very least. My main issue with the handle is just that the checkered grip texturing is over-aggressive and hot-spot-producing unless you buff the points off it with some fine sandpaper. afishhunter, Insipid Moniker, DocJD and 1 other person like this. Al Mar Pathfinder back in the 80's . Expensive , shiny stainless machete / short sword . Broke it in the first few minutes of normal use . Al Mar replaced it but I never really trusted it not to fly apart again . 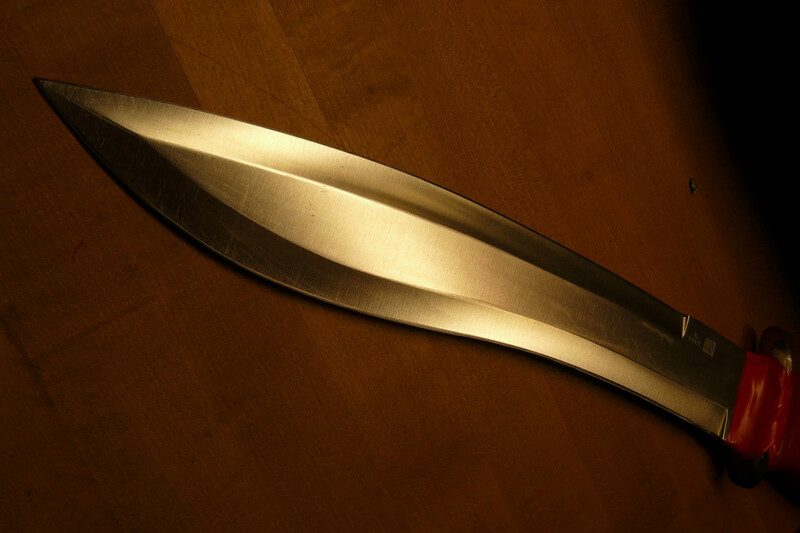 The 2nd one developed loose handle scales . Seems there's only one central pin that kinda acts like an axle . Poorly designed and built . I never bought anything Al Mar again . NewWaveGuy, strategy9, Rhinoknives1 and 2 others like this. Randall Made Knives.....currently, and for several years now, falling further behind with retirements and unexpected quittings, and been cranking out some real dogs, logs for handles, buggered guards bobbed and "saved", etc..
and they send you a letter and refund check on knife awaited five years which was not made properly and returned (a "nearly indestructible" stainless Model 14 ground as thin edged and long thin tipped as a skinner and blade shaped nothing like any (of half a dozen old and new) #14 ever owned, and keeping in mind already have dented an Astro left soft), and the letter says "sorry you don't like our knives and we have decided to not make you a new one." I sold most all of them after that, and will never contribute a dime to their company. They expect you to take what they make, and bloody well LIKE it. NewWaveGuy, sharp thoughts, MeanBeaver and 8 others like this. For me, the absolute worst smoking turd of a "knife" ever produced was the Schrade Cliphanger. When they came out, all my buds had to have one. Has a handle less ergonomic than a cactus, a wobbly blade that wouldn't cut hot butter, and a deployment system clearly designed by Hellen Keller. POS royale. kfalk, kbirk2003, Quiet and 4 others like this. Probably a Benchmade 300? At least that's what sprung to mind. It wasn't really hyped but it was overpriced especially when you consider that it's a flipper than can't flip. Mark Boyles, miltmaldo and Joshua1973 like this. Lock slip, lock rock. Basically every lock issue imaginable. I had one that the lock rock like crazy. I was able to fix it by bending the lockbar in but not a good look. Sebenza 21. The design and execution are spot on with the exception of the hardness of the S35VN blade, which I think is too soft. I am much happier with disposable Benchmade beaters even if they don't lock up like a bank vault. sodak, Ulf Krogstad, FortyTwoBlades and 1 other person like this. Like said above, Manix LW S110V for me. I tried to like it, but the blade grind is just too shallow. It does not cut well, even after reprofiling the edge to 13DPS. steff27 and Joshua1973 like this. Yep. Good knife overall but highly overrated. Nothing really wrong with it but it’s just not that special in today’s field of knives. And it’s much too expensive. Mine came dull with a thick edge that I’ve never been able to get it more than passably sharp. katanas, salduchi and Joshua1973 like this. I have owned four. Only two had acceptable detents and I only have one of those two to this day. One of the biggest issues with with their soft detents is that the jimping next to the flipper tab is pretty sharp. I've busted my finger tips up on them a few times. When their popularity was at its fever pitch, they were selling for more than some customs. Really loved the knives otherwise, wish I could've carried more of them. Hopefully the larger Half Track is free of these issues, I'm really excited for that one. ridnovir, OilMan, Nautique and 1 other person like this. Officer's Match, Charlie Mike, craytab and 3 others like this.